24/9/10 – Acquisition – Washington, The Society of the Cincinnati – Thomas François Lenormand de Victot, Lieutenant of the king’s vessels, fought in the American Revolutionary War and was wounded in combat when the French Navy captured Grenada on 7 July 1779. This earned him the decoration of the Ordre Royal et Militaire de Saint-Louis. The medal can be seen clearly on his chest in this curious painting by Nicolas-René Jollain sold by the Galerie Mendès to the Society of Cincinnati (ill.). 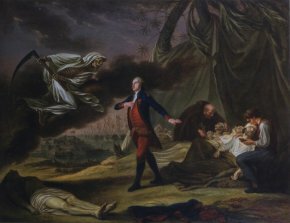 It depicts the officer facing Death, a skeleton draped in white wielding a scythe, in order to protect his wounded soldiers during the battle in the Saintes Islands ; the action took place in April of 1782, shortly before the capitulation of the French fleet at the hands of the British. Lenormand de Victot had himself fallen on the first day of the fighting, on 9 April, and died the following day. 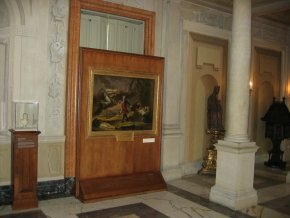 This is therefore a posthumous allegorical painting paying tribute to the hero’s courage. The Society of Cincinnati was created in 1783 by American and French officers who fought in the American War of Revolution to “preserve the rights and liberties for which they fought and to maintain the ties of friendship formed during the long years of war.” Today, it is a historical society whose members are direct descendants of these officers. Its headquarters, located in Washington, house an important library and a museum devoted to the American Revolution with, notably, furniture, arms and portraits. That of Lenormand de Victot has now joined this historical collection (ill. 2). For example, the tomb of Languet de Gergy by Michel-Ange Slodtz at Saint Sulpice in Paris.